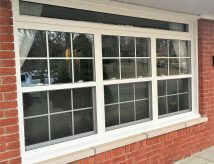 A single or double hung window is a common style of window for living rooms, bedrooms, and other rooms in the house where ventilation is desired along with ease of cleaning the glass. A single or Double hung window has one or two sashes that overlap slightly and slide up and down inside the frame. The Sashes can be tilted inside the room for ease of cleaning the glass. Materials – Vinyl, Wood, Wood and Vinyl Hybrid, Wood and Aluminum Hybrid.